This Close to Happy is the rare, vividly personal account of what it feels like to suffer from clinical depression, written from a woman’s perspective and informed by an acute understanding of the implications of this disease over a lifetime. 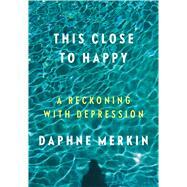 Taking off from essays on depression she has written for The New Yorker and The New York Times Magazine, Daphne Merkin casts her eye back to her beginnings to try to sort out the root causes of her affliction. She recounts the travails of growing up in a large, affluent family where there was a paucity of love and of basics such as food and clothing despite the presence of a chauffeur and a cook. She goes on to recount her early hospitalization for depression in poignant detail, as well as her complex relationship with her mercurial, withholding mother. Along the way Merkin also discusses her early, redemptive love of reading and gradual emergence as a writer. She eventually marries, has a child, and suffers severe postpartum depression, for which she is again hospitalized. Merkin also discusses her visits to various therapists and psychopharmocologists, which enables her to probe the causes of depression and its various treatments. The book ends in the present, where the writer has learned how to navigate her depression, if not “cure” it, after a third hospitalization in the wake of her mother’s death. Daphne Merkin, a former staff writer for The New Yorker, is a regular contributor to Elle. Her writing frequently appears in The New York Times, Bookforum, Departures, Travel + Leisure, W, Vogue, and other publications. Merkin has taught writing at the 92nd Street Y, Marymount, and Hunter College. Her previous books include Enchantment, a novel, and two collections of essays, Dreaming of Hitler and The Fame Lunches, which was one of The New York Times Book Review’s Hundred Notable Books of the Year. She lives in New York City.